My favorite way to make deviled eggs — sprinkled with lots of everything bagel seasoning! After sharing my go-to classic deviled eggs recipe yesterday, I’m back today with one more version that happens to be my personal fave. After having been on a major everything bagel seasoning kick the past few years with my eggs — sprinkling it on my hard-boiled eggs, fried eggs and scrambled eggs on the reg — it only recently occurred to me that the seasoning would probably be equally delicious on deviled eggs too. So last week, Barclay and I decided to give it a try for a weekend brunch. And sure enough, these everything deviled eggs were egg-ceptional. Turns out that the famous sesame-poppy-garlic-and-onion blend that we all love pairs perfectly with the savory flavors of classic deviled eggs. And when made with my foolproof stovetop or Instant Pot hard-boiled eggs — up to a few days in advance, if you would like — this recipe is a breeze to prepare. 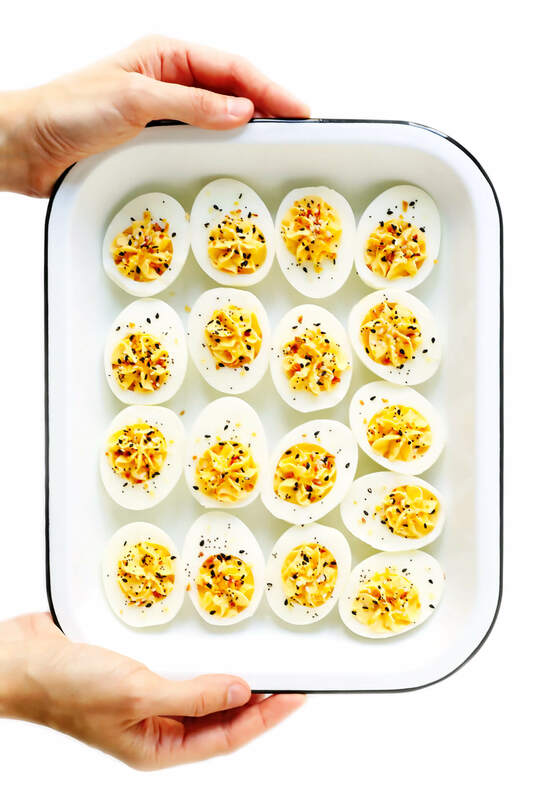 Perfect for Easter, weekend brunch, or anytime you’re craving an egg-cellent batch of deviled eggs.